Now, it’s time to gear up for Write the Docs Prague in September! And thank you for all of your suggestions! Thanks to everyone who helped out–see you at the WTD table in Prague or back in Portland next year! Sphinx, Jekyll, and Asciidoctor are parsing engines; rST, Markdown, and AsciiDoc are source file formats; and Python and Ruby are programming languages. So you can write in rST to publish with Sphinx, which is written in Python. Or, you can write in Markdown to publish in Jekyll, which is written in Ruby. In general, Sphinx parses rST, and Jekyll parses Markdown. There are also plugins out there to make Markdown work with Sphinx (like recommonmark), or to make rST work with GitBook. All static site generators generate output in HTML, along with some that generate PDF, ePub, HTML inside JSON, and other formats. This blog by David Walsh is a great primer on static site generators, especially if you’re interested in the plusses and minuses. The Docs as Code book and articles have a lot of great content around this as well. 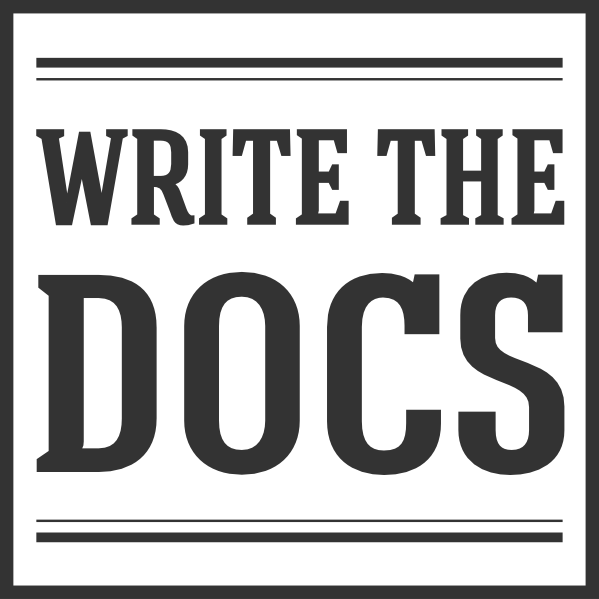 The latest Write the Docs podcast is available! It’s all about where technical writers fit in different organizations. Check it out! This month, a documentarian asked the group about the rules they follow for cropping and resizing large screenshots in documentation. Several people agreed that when you have multiple screenshots in a single document, they should be as close to the same size as possible. For example, reduce all screenshots by the same percentage, or apply a single fixed width (with the height set to “auto”) to all screenshots. Another suggestion was using cropped versions of large screenshots that readers can click to open the original full-size image, perhaps in a pop-up window. Others resize to standardized sizes based on the image content, such as resizing all full-screen captures to 800px width. Others suggested avoiding cropping altogether and using shading to highlight specific areas on screenshots. Avoid cropping out any on-screen context that readers might need to make sense of your screenshots. Use center-alignment for images to make and size differences less obvious. Try to make sure screenshots represent “stable” work (or at least balance the amount of work you spend on perfecting screenshots against the risk that the interface will change). Compromise! For example, use short descriptors as the default. When the product team strongly feels like users will need a longer explanation, include a help symbol that users can click or mouse-over to display the longer explanation. Strengthen your case with ideas about progressive disclosure: basically, providing the least amount of information that will do the trick (in this case, help users do what they whatever it is they want to do). WTD documentarian Mike Jang also offered up the slides from his OSCON 2017 presentation about simplicity in UI text. And here is a source that cites studies about how long sentences detract from reader comprehension. If you can’t make progress against the pushback, you’ll need to talk to the product director and explain what’s going on. If product owners are resistant, all you may be able to do is make suggestions that they may or may not follow. Proposals are in for Write the Docs Prague, and we expect to announce the schedule by mid-June. Stay tuned! The WTD meetup groups are planning some interesting events–maybe there’s one near you. If not…consider starting a WTD meetup in your area! New York, June 20: Notes and scribbles–what counts as documentation?